Carl Fogarty launched his new WSB team in Italy at the weekend, and revealed that up to 10,000 of the Foggy Petronas triples could be put into production. They will follow the first 75 very expensive homologation specials required by WSB rules. The bike won’t be able to compete until the Laguna Seca round on July 14. That’s because the 75 homologation bikes won’t be ready for the first deadline on January 31. Instead, they are aiming to have all ready by the season’s second deadline, June 30. The race bike is expected to be tested in March or April, 2002. • The team will be based near Donington Park and will be next door to the Petronas-backed Proton British Touring Car Championship team. • One experienced rider is considered the most important challenge for the team to find. • In 2004 a new, high-volume bike will be designed to race under the proposed 1000cc flat-limit rules being drawn up for WSB. • A naked bike using the 900cc three-cylinder Sauber-designed engine is also a possibility for the future. 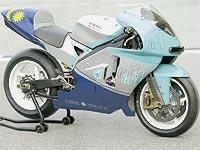 • The race bike could be leased out to British or American superbike teams in 2003 by Petronas. • Niall Mackenzie will almost certainly continue in his test and development role with the team. • The chassis will be built by Fabrications Techniques – the company responsible for making the chassis for Kenny Roberts’ GP team and the Derbi 125GP team as well as Formula One teams over the years. • WSB boss Paolo Flammini has confirmed he wants to buy one of the first bikes to reach production. It’s clear the situation involving Foggy and Petronas is changing every day – all of these developments have occurred since the news became public three weeks ago. Foggy said: " What the bike looks like at the moment is nothing like it will do when we have finished working on the aerodynamics and the chassis.
" We do not know exactly what it will look like but if you think of a cross between a Ducati 996 and an MV Agusta F4 you will not be far off. All of us appreciate how gorgeous these bikes look and that is what we are setting out to achieve with the FP1. " Read more on this story in MCN, out on Wednesday. Foggy will be joining us for a live webchat within the next few days. Keep checking back for dates and times.